Disclosure: Thank you to hello products for sponsoring today's post! Toothpaste isn't something that I make a conscious decision about when I run out and need to buy some more. However, in an effort to be more naturally friendly in all aspects of my life, I've just started looking into getting "safer" toothpastes. The ones I've tried have been... quite unpleasant, to be honest. I was almost ready to give up on the search for a naturally friendly toothpaste, but then hello toothpaste came into the picture. And it was love at first sight. 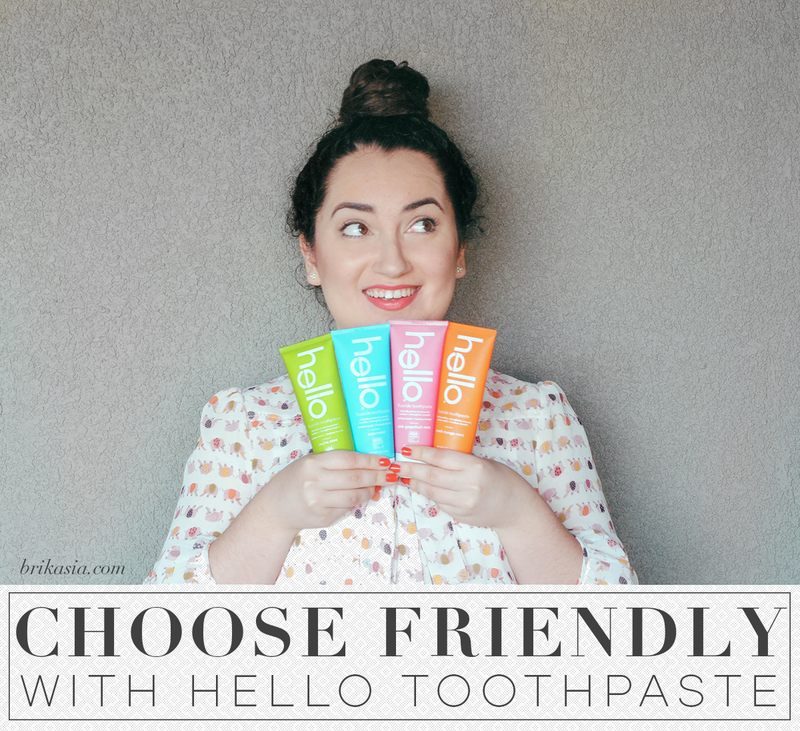 Before I start raving about my love of hello, I gotta say that I'm a huge fan of their slogan: choose friendly. It is so easy to get caught up in our own lives that sometimes we don't realize the effect we have on other people. All it takes is one tiiiiiny good deed to brighten someone else's day up. hello is on a mission to make the world a friendlier place, and ya know what? I'm totally with them on that. Both yesterday and today, I decided to "pay it forward" at my local coffee shop. Doing such a small thing like paying for someone else's coffee didn't seem like much, but not only did it cheer up the person behind me, but I felt pretty great myself! While it probably isn't practical to do this friendly initiative on a daily basis, this is definitely something I'm going to do every couple of weeks. So thanks to hello, not only did their toothpaste brighten my smile, but their mission to make the world a friendlier place has brightened my day! Ready for the nitty gritty on hello? Clinically proven to strengthen enamel and protect against cavities, these awesomely delicious pastes polish teeth and freshen breath in flavors like supermint, mojito mint, pink grapefruit mint, and their newest -- peach mango mint. Formulated without artificial sweeteners, dyes, or preservatives (not to mention things like triclosan or polyethylene microbeads – look ‘em up! ), hello products are never tested on animals and made in the USA. Got kids? Not a problem! hello is also introducing a kid’s line, featuring the same great formulas but in mint-free flavors kids will love, like Bubble Gum, Green Apple, and Blue Raspberry. Leaving out the mint means kids will brush longer, for healthy, sparkling smiles! You can find hello’s line of new toothpastes at various retailers across the USA, with their new Peach Mango Mint and kid’s lines found exclusively at select Target stores. Besides the fact that they're delicious, my other favorite thing about hello is how well-designed their packaging is. I won't be hiding this under my bathroom sink! Have you ever tried anything from hello? Make sure you check out their products at Target! Disclosure: This post is sponsored by hello. I am definitely heading to Target to try a few of these out! I saw this line of products probably at Target, and the packaging just jumped out at me. Gotta check 'em out! There's a pink grapefruit toothpaste? Why am I using the boring ones?? ohhh a kids line! on it! Love the packaging! These sound really amazing! I will definitely have to pick some up on my next trip to Target! Thanks for the awesome review! Ooh, these are adorable and I totally want to brush with peach mango mint! I totally want to try these!